Your time with us includes everyday interactions with the people and community who call this home. We introduce you to aspects of the local Indigenous culture - past and present - and we collaborate to support local community aspirations, cultural protocols, and ecological stewardship. 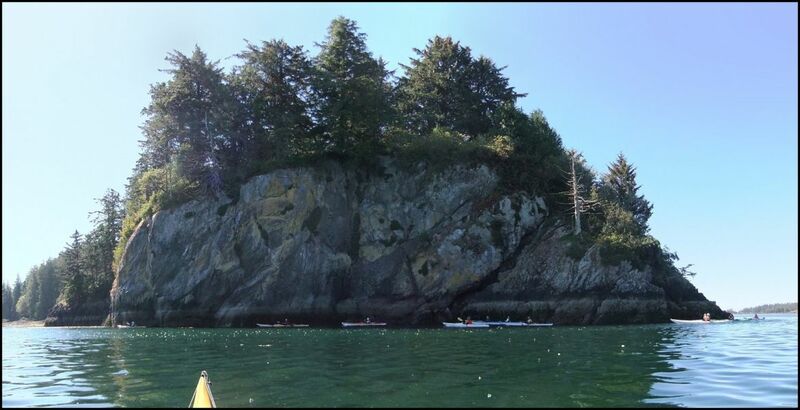 Since 1972, West Coast Expeditions has operated almost exclusively in the territory of the Kyuquot ( Ka:'yu:'k't'h')/Checleset (Che:k:tles7et'h') First Nations, specifically in the areas of Kyuquot Sound and Checleset Bay, including the Mission Group of Islands, Rugged Point, the Bunsby Islands, the Acous Peninsula, and the Mquqᵂin/Brooks Peninsula. This area is home to the welcoming Kyuquot ( Ka:'yu:'k't'h')/Checleset (Che:k:tles7et'h') First Nations' people (Kyuquot - pronounced "kie-you-kit" and Checleset - pronounced "check-le-set"). West Coast Expeditions is part of the Kyuquot area and community. As owners, Bev Michel (a Ka:'yu:'k't'h' woman) and David Pinel and Caroline Fisher (adopted into the Ka:'yu:'k't'h' / Che:k:tles7et'h' Nations) share - and appreciate - truly close bonds with our friends and family in the nearby community. Active as marketing stakeholders with the Indigenous Tourism Association of BC, furthering the discussions, planning, training, and product development for excellence in Indigenous tourism experiences in British Columbia. Longstanding site use agreements with the Kyuquot/Checleset First Nations, and summer student employment opportunities. 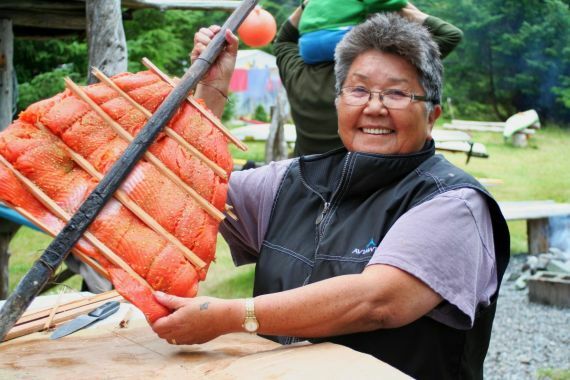 Weekly traditional Indigenous salmon dinners as part of our 5 and 6 day base camp kayaking packages, prepared and hosted by the Jules family since 1992! Expedition visits with long-time friend, expert weaver and Checleset elder, Lucy Paivio and husband Lennard Paivio who has also helped with some of our camp infrastructure. Regular water taxi services from Leo Jack (Voyager Water Taxi), Archie Vincent (Storm Chaser), and other local operators who are certified with insured vessels. Contract labour assistance from local youth helping with camp improvements and trail maintenance – helping us to maintain these for all locals to enjoy, and visitor/guest use. Access to pieces by local Indigenous artists, including carvers, painters, and weavers such as: Lucy Paivio, Jesse Gillette, Don Leo, Danny Short, Steve Jules, and Charles Jules. Regular visits with our guests for a coffee or pie at Java the Hutt and the Old Schoolhouse Restaurant at the Kyuquot Inn. custom itinerary transportation of guests, kayaks & freight aboard the MV Uchuck III (Nootka Sound Service). 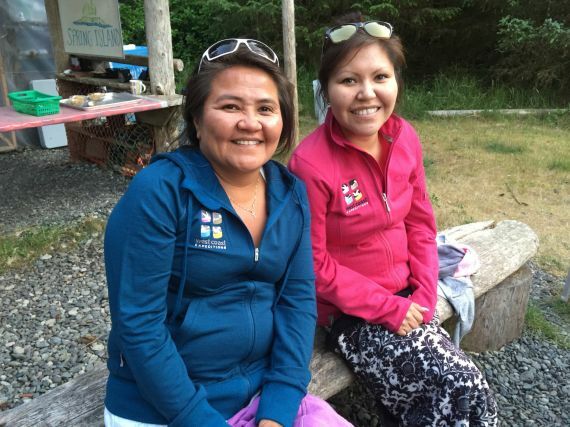 custom itinerary transportation by float plane with Air Nootka, based in Gold River. Parking, moorage, and fuel purchases from Fair Harbour Marina, which is owned and managed by the Kyuquot-Checleset First Nations. Purchase of camp supplies, as needed, from the Kyuquot Market general store in the nearby village. Cooperative relationships with all local businesses, including the Kyuquot Inn, Murphy's Sport Fishing, Kyuquot Beach House, Sea Otter Lodge, Rugged Point Lodge, Walters Cove Resort, and many others. Active participants and contributors to community and industry input for the Kyuquot Sound Coastal Plan and other local and regional planning processes. Lease of a high-quality and diverse new fleet of kayaks each season from Comox Valley Kayaks & Canoes in Courtenay.